Maxim Integrated Products has introduced its latest tiny, highly integrated power-management IC (PMIC). The ultra-low-power MAX20345 integrates a lithium charger and debuts a unique architecture that optimizes the sensitivity of optical measurements for wearable fitness and health applications. In wearables, optical-sensing accuracy is impacted by a variety of biological factors unique to the user. Designers have been striving to increase the sensitivity of optical systems, in particular the signal-to-noise ratio (SNR), to cover a broader spectrum of use cases. 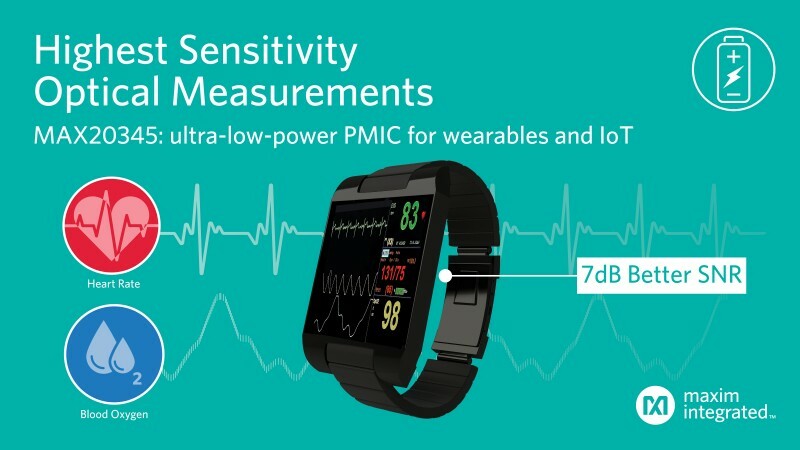 Traditional low-quiescent-current regulators favored in wearable applications come with tradeoffs that degrade SNR on the wrist, such as high-amplitude ripple, low-frequency ripple and long-settling times. Some designers have even turned to high-quiescent-current alternatives to overcome these drawbacks, but they must deal with increased power consumption, which reduces battery runtime or requires a larger battery. According to Maxim, the MAX20345 features a first-of-its-kind buck-boost regulator based on an innovative architecture that’s optimized for highly accurate heart-rate, blood-oxygen (SpO2) and other optical measurements. The regulator delivers the desired low-quiescent current performance without the drawbacks that degrade SNR and, as a result, can increase performance by up to 7dB. Extended Battery Life: regulators with nanoPower quiescent current reduce sleep and standby power, which in turn extends battery runtime and allows for smaller battery size. High-efficiency regulators preserve battery energy during active states. This entry was posted in Industry & Enterprise, Product News and tagged mobile, optical, PMICs, power management, wearables by Circuit Cellar Staff.